Stelrad, the UK's leading manufacturer of stylish modern radiators, has taken on new apprentices at its Rotherham facility as it forms a partnership with the RNN Group. 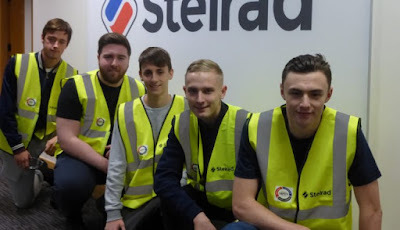 At its premises at Swinton, Stelrad has taken on five apprentices as production technicians for a two-year period, as part of its drive to provide career opportunities to local young people, whilst introducing new blood into the business. Stelrad has formed a partnership with local training company RNN Training and the apprentices will divide their time between work based learning on the job at Stelrad and regular skills learning at Rotherham College. Mark Evans, operational training and competency officer at Stelrad, said: "For the first year, the apprentices will have set time periods across different departments. They start off in the office doing a few days with HR, one day with Credit Control and Purchasing and so on, so they can see the whole Stelrad process in action, from the production of the material to distribution." This varied and hands-on approach has proven popular with the apprentices, with the new learners commenting that the training was a good opportunity to understand all the different aspects of the business, which will give them insight into which area they would like to progress into after their apprenticeship has been completed. The idea is to educate the apprentices in "the broad spectrum of the inner workings of Stelrad, from raw material coming in to radiators being sent out at the end." Having been an apprentice himself, Mark understands the advantages of learning on the job. He added: "Our operations director and our production manager trained as apprentices as well as me. We all think it's an ideal opportunity for these guys to develop themselves and their skills, and for us to invest in our local community." RNN Training worked closely with Stelrad to find the right candidates for the apprenticeships, providing everything on the doorstep from support with the slection process to facilities at the group's Dinnington Campus. Stelrad hopes to expand its apprenticeship intake in the future, branching out into different areas as the partnership with RNN Training progresses. Evans, added: "Apprenticeships are the foundation stone of bigger and better things. So from this, we're hoping to bring in an intake of four or five apprentices every year and the hope is that in three or four years' time, it'll be these guys who are training our other apprentices." Charlie Grayson, business development manager at RNN Training, added: "This new partnership with Stelrad is an important step in strengthening our connections with local employers and in ensuring that young people continue to learn and develop in an educational environment that suits them best. We look forward to continuing our work with Stelrad in the future."